An ex-prime minister and president of Maoist Party, Puspa Kamal Dahal (aka Prachanda) is best known for his gorilla warfare. After spending ten years in the jungle, he finally said, “I want piece”. Many political parties were happy, including the King. Only years later, it became clear that he wanted a piece of the ruler’s throne. As he nears close to becoming the President and having a piece of that throne, he has suddenly became nostalgious of his teacher days when he used to ride his bicycle to the school. In an interview a few days ago, he got very emotional and said, “यदि भारतले नाकाबन्दी गरेमा हामी गाडी छाडेर साइकलमा चढ्ने छौं।” This translates to: If India declares blockade against Nepal, we shall ride our bicycles. Many political analysts believe his statement appears antagonistic to our friendly neighbor India. So, to investigate, our senior and smart correspondent ‘Chatur Nepali’ interviewed Prachandaji at his new residence in Kathmandu which is fitted with a swimming pool, automatic doors, bulletproof windows, security cameras, motion sensors, occupancy sensors, and other hi-tech systems for his safety (and comfort). Below is a rushed transcript of the exclusive interview. Chatur Nepali: Prachandaji, I’ve been a big fan of your motivational speeches, you are a visionary leader. Why did you say you want to ride a bicycle? Prachandaji: Chaturji, that is a very calculated statement, as usual. There are four reasons behind that declaration. First, most teachers in Nepal ride bicycles to their work and you know I was a teacher before I became a gorilla fighter, I mean guerilla. So, I want to represent their voice and win their vote with that statement. Second, even after I became a gorilla fighter, I did not stop riding bicycles. You can ask Baburamji. I used to ride bicycles in dense forests. I was very fit and my personality reflected that of a leader. However, since 7 – 8 years, I have been riding in imported four-wheelers on government stipends and am starting to gain a belly. No one has mentioned this to me explicitly but it is obvious when I look at my pictures in daily newspapers. So, I need a lifestyle change and that is why I want to start riding bicycles. Third, the UN has sent us a letter that the burning of our constitution by some irresponsible Nepalis abroad has impacted climate change. To appease the UN, the international community, and offset those carbon emissions, we Nepalis have to sacrifice a little and ride bicycles. Fourth, if I don’t become the next President, I cannot think of any reason why I won’t be, but let’s say hypothetically I don’t become one, I am thinking of starting a business. And perhaps a business around the import and export of bicycles would be a pretty profitable business. I am just creating a demand right now in case I end up opening a bicycle business. Chatur Nepali: Prachandaji, you are a forward thinking statesman as you have demonstrated. Why did you make this statement against India, it appears antagonistic, no? Prachandaji: Chaturji, 11 years ago, several of my comrades were captured by Nepal Army in a battle in Rolpaap. A few of us were trying to escape on our bicycles. But as I was riding downhill along a gravel road in Rolpaap, my brakes stopped working. I fell and broke my glasses and a few bones. My comrades saved me but we investigated that bicycle and found out that the bicycle was made in India. Since that day, I have developed a sense of antagonism towards Indian bicycles. My statement is against bicycles made in India, not India as a whole. You know, I make calculated statements. Chatur Nepali: I see. But Prachandaji, Nepal does not manufacture any bicycles. Prachandaji: You are right. I will discuss with my central party committee, NC, and CPN UML before deciding which country we will import the bicycles from. Chatur thanked Prachandaji for his calculated statement, this exclusive interview and headed to Terai to ask fellow countrymen about their visionary leader’s statement. Chatur: Why do you think Prachanda told that we could cycle? Rameshiya: I think he is very environment friendly. Chatur then found a bicycle shop and went in. Chatur: Sir, why do you think Prachanda told that we will cycle? Jilebi Pahalwan: I think Prachanda is very happy with me. He has advertised about cycles and as soon as he did that, 10 people have already bought cycles. Chatur then found a woman washing clothes. He approached her. Chatur: What do you think is common among our leaders these days? Gulab Devi: Leaders these days seem to be focusing more on advertising. Last week, K. P. Oli sir advertised about mangoes and my neighbour who sells mangoes has become rich and went abroad yesterday. 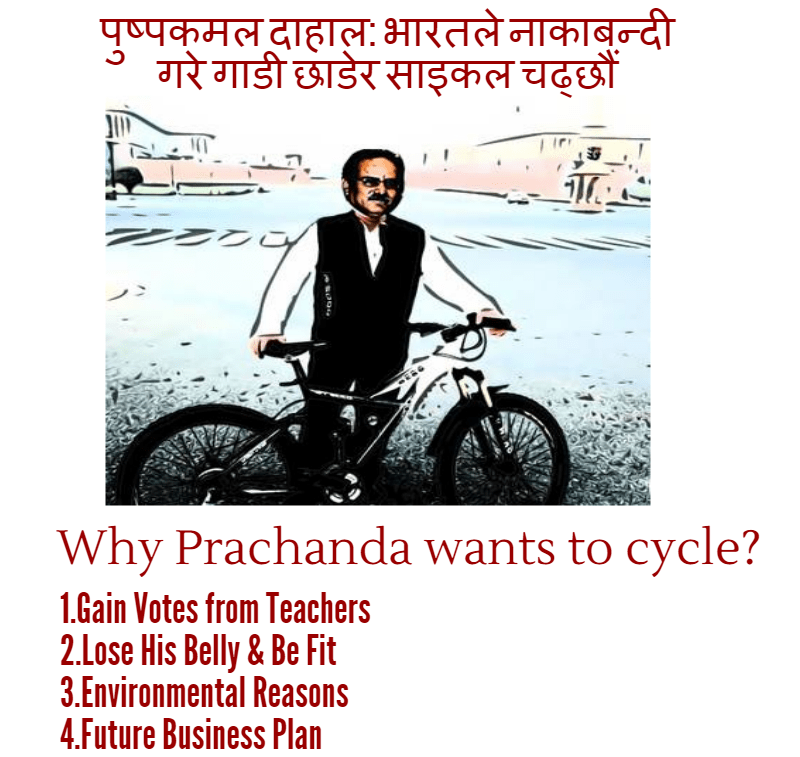 And now, Prachanda Sir has talked about cycles. I have asked my husband to set up a cycle shop soon.